Waterloo – Five Game Design and Development students from Wilfrid Laurier University had the unique opportunity to present a series of escape rooms they designed to a group of international bloggers, media and invited guests at the second-season premiere of the Amazon Prime Original TV series, You Are Wanted, during an event May 16 in Germany. 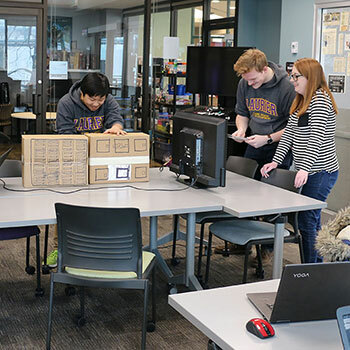 The students, Edward Copping, Kaelan Dunbar, Austin Lee, Jellena Vulic and Robert Durant, developed the four rooms under the supervision of Laurier Professor Scott Nicholson and Postdoctoral Research Fellow Emily Flynn-Jones. The students, who are in their first, second and third years of the Brantford-based Game Design and Development program, had three months to design the rooms, which are based on the cybercrime theme of the You Are Wanted series. “The hardest part was trying to make it easy enough for people at varying skill levels to complete within 10 minutes,” said Copping. Nicholson and Flynn-Jones recruited students who had experience playing a large amount of games and the different skillsets required to complete a project of this scope. Skills such as project management, public speaking, working with clients and on a team are essential to success. The paid positions provided students with hands-on experience that will help them find careers in fields including user experience design, video game design, human resources, training and consulting services. “Game design is what I wanted to do my whole life,” said Copping. Laurier’s Game Design and Development program has garnered international recognition since it was launched in 2015. Nicholson and his students have been invited to develop games for a number of high-profile events, including the Red Bull Mind Gamers world championship escape-room competition.